If the Ferguson movement goes from the streets to the workplaces, what will we do? From February to April 2011, everyone had their eyes on Wisconsin, praying for or dreading the widespread, self-organized strikes against the state’s austerity measures that seemed like a real possibility. So much has happened since then that it almost seems like ancient history, but this movement was seen by many of us at the time as a turning point in American politics, and I think that judgment will stand. 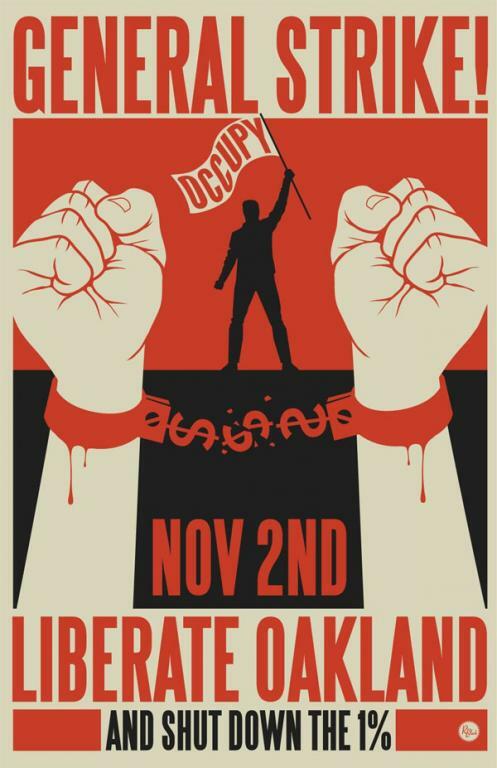 Whatever faults Occupy may have had or developed, the best elements had the ambition to call for a general strike, such as in Oakland three years ago – this couldn’t have happened if the “Sconnie Spring” (as I’m now dubbing it) hadn’t raised the possibility of a general strike in the US for the first time in decades. In hindsight it seems clear that a general strike was not on the cards in Wisconsin, but at the time the Democratic Party and the union leadership went into full assault mode to prevent any kind of industrial action, on any level, by any group of workers – they knew as well as we did that the mood had got to the point where any strike might have spread very quickly. Wisconsin had little to do with fighting racism or police brutality. Some of the protesters thought the police were on “our side”, and many people were concerned about protecting the unionized prison guards from privatization. Almost no one said anything about the fact that Wisconsin incarcerates Black and Native men at a higher rate than anywhere else in the country, or asked what public sector union rights mean for the 50% of Black men in Milwaukee who have been deemed felons by the state and made nearly unemployable. What does Wisconsin have to do with Ferguson? The Wisconsin movement was and is the best example in recent history of our union intervening in a major class struggle, and influencing it in a positive direction and to a notable degree. It brought us a lot of notoriety, a large spike in new members, and spurred on new IWW organizing in Madison and elsewhere. We certainly could have done better on some details, but in our ambitious attempt to push as far as we could from within the movement, we were overwhelmingly right. Our biggest missed opportunity was not any one particular thing in Madison. It is our ongoing failure to draw lessons from the experience and adapt our organization so that we’ll be better suited to take part in future class struggles. We know a lot about the dynamics of small workplace organizing because we’ve tried it hundreds of times, ran into walls, discussed what happened and how to improve, and tried it again. This is why we have things like the Organizer Training Program. However we’ve only had one recent experience of engaging in a large social movement where we were able to promote wildcat industrial action, and seemingly pose a credible threat to the hegemony of the Democratic Party and the union leadership. Our Convention, as our highest spot for debate and decision making, should be used to draw out the lessons both of our workplace organizing and our possibilities for large scale agitation, so that our organization can grow through continual reflection. Juan Conatz and I co-wrote an analysis of our union’s activity in Wisconsin, which also contained proposals for how the union could grow from the experience. The essay was distributed at the 2011 Convention but not officially discussed. So far our union has still never had any official discussion about that movement, to decide what we did well or poorly, and how we would do it differently next time. This means that if another large social movement erupts, and we want to participate in it, we will be starting from the drawing board. What will happen when Darren Wilson is acquitted? I don’t think any of us can guess. But the very real anger over the increasingly brazen murder of Black and Brown men by White police officers could very easily turn into street rebellions, in St Louis, LA, Chicago, New York… If it does, we can and obviously should support it morally. The question becomes, what do we have to contribute materially? I’m normally against “revolutionary Dungeons and Dragons” as we see so often on the American left with microsects that spend more time fantasizing about storming the winter palace than focusing on the reality of people’s work and everyday lives. One of the things I love about the IWW is that we avoid that tendency, for the most part, by basing ourselves in workplace organizing and interacting with living workers, rather than just reading and writing about dead theorists. The best theorists, after all, grew out of organizations based on regular working people fighting their exploiters, not tiny clubs of other intellectuals. That said, I also think we do need to teach ourselves how to raise our sights higher, and so I’ll break my own rule, and go into fantasy land. I’ll sketch out a few scenarios without asking how likely they are at the present moment. Let’s suppose that Darren Wilson’s upcoming acquittal provokes large scale street rebellions, and that they somehow spread into workplaces. I can imagine two possibilities. The first would be for state, county, and municipal employees in St Louis to begin protesting against the militarization of their state and the murder and arrest of their family members and neighbors. It might start with joining protests and vigils after work, but could lead to some of the workers beginning to support a political strike in solidarity with the protests and against the police. The other scenario is if there are rebellions across the country, some of the people involved also work at UPS and hear about our action there, and begin to organize with coworkers to do something similar. If either of those gained any traction, we would see the full force of the Democratic Party as well as AFSCME or the Teamsters respectively come down against any kind of workplace action, just as we saw in Wisconsin, or during any time when those of us who enrich our exploiters through our work, threaten to stop working. The momentum would be channeled into protests outside of working hours, “get out the vote” campaigns, and the usual baloney. We know what they would do, because they do it every time. The question is, what would we do? How would our organization reach out to those workers, and support their organizing, both to spread it as much as possible and to minimize any retribution afterwards? While we’re still putting together our wish list, let’s take another step. The scenarios I’ve laid out imagine a movement that develops independently of us, which we try to intervene in. Since we should be ambitious with our organization, let’s imagine what it might look like if we were able to consciously develop pro-strike movements among Missouri government employees or UPS sorters around the country. If we can imagine a concerted effort to reach out to tens of thousands of UPS workers to organize industrial action against shipping police equipment, and everything that this implies including at some level a very real conflict with the Teamsters bureaucracy, then we have to ask ourselves, what are the steps between our current organization, and the IWW that would be capable of pulling that off? How can we get from here to there? I’ll wrap up this post by restating three questions. I invite responses in the comments. 1) If the anger over Mike Brown’s murder spreads into any kind of workplace action, anywhere, what are the concrete steps we can take to publicize it, help it spread, provide some kind of support against the recuperation of the Democratic party/union leadership, and defend the participants against retribution? 2) What concrete actions can we do in the current moment to promote industrial action against police murder and the militarization of Missouri, as we recognized we want to do during Convention? 3) The song “Fifty Thousand Lumberjacks” refers to a coordinated strike across the entire pacific northwest, with the so-called “thousand mile picket line”. If we can imagine fifty thousand package handlers holding a thousand mile picket line on police goods going into Missouri, that is organized and coordinated by the IWW, what can we do to bring ourselves to that level? Posted in IWW, USA.Tagged BlackLivesMatter, IWW. I think one of the challenges is how do we work with what we are building and not just drop everything to throw our lot in with this fight. I kind of felt like that was what we were doing with the IWWs scattered involvement in Occupy. What I really liked about the UPS action in relation to Ferguson was it built capacity on the floor while trying to support a mass protest movement. The key here is that we need to have a constituency to bring to the fight in solidarity. I agree we need to work with what we have. That being said, we can make plans for what we can organize, and what we can do if workers leap beyond us. It’s the dialectic of spontaneity and organization. As I’ve pointed out regarding the Wisconsin movement, what relevancy we had came in large part because of long-term dual-card members in Madison, as well as respect that we’d gotten for organizing at Jimmy John’s in Minneapolis. We were one of the only two left groups with a significant local presence before the movement (the other being the ISO). I agree about the UPS action too, that it builds worker power and confidence on the shop floor at the same time as it takes a public stand. My point in asking this stuff is to get us asking ourselves what we would do if UPS workers in St Louis, LA, or New York started copying the #HandsUpDontShip? Or what would we do if an anti-police movement came up among municipal/state employees in St Louis? As far as I’ve seen the only workplace action around all of this, besides the UPS one, has been the St Louis Rams players. If there were any trend towards workplace action against police brutality, militarization, and racism, that would be worth millions of facebook posts. I’m extremely glad I came across this incisive article. Many of the questions raised in it are ones that I’ve been grappling with for some time. In short, as it stands today, I think that the future of the entire class struggle hinges upon linking the burgeoning resistance movement in opposition to racist police violence to the low-wage workers’ movement. [From the outset of this movement] fast food workers – along with many other activists and community members – were at the very heart of the struggle in Ferguson. Clearly, this isn’t a coincidence. In the United States as a whole – and, indeed, in Ferguson specifically – fast food workers disproportionally come from low-income communities of color. These are, of course, the very same communities that tend to be victimized by systemic over-policing and racist police violence. Thus, in Ferguson, Black and Brown fast food workers were naturally at the center of the uprising because they’re from where Michael Brown is from. As a result, they know what it’s like to be subjected to – and see their friends, co-workers, and loved ones subjected to – racist police violence and abuse. On top of that, the experience of taking part in the SEIU-backed fast food workers’ organizing campaign clearly prepared a number of local workers to play an important role in this movement as rank-and-file leaders and organizers. All this points to a broader axiom about the strategic position that fast food workers now occupy within the U.S. class struggle. In short, as it stands today, fast food workers are objectively situated to play a lead role in advancing both the trade union movement and the struggle in opposition to racist police violence. This potentiality has been bolstered by the Fight for 15 campaign, which has helped to train and organize a core of militant, pro-union workers in cities across the country. Beyond this, due to the widespread publicity that’s surrounded this campaign, Fight for 15 has also had a politicizing impact on fast food and low-wage workers in general – even those that have opted out of becoming involved in the movement. Thanks for the comment. I’m looking forward to reading your piece. The two scenarios I outlined were meant as thought exercises of what we would and could do if workplace agitation or action began to grow out of the Ferguson movement. In particular I wanted to raise the question of the UPS as, modest as the action there was, it’s so far the only workplace action I’ve heard about that is directly related to Ferguson. I brought up municipal/state workers in St Louis in an attempt to imagine what public sector action would look like. In fact we are seeing that play out among New York teachers right now. However, I don’t think I agree that fast food workers are “objectively situated to play a lead role”. They might or might not play a lead role but I don’t see how they are more “objectively situated” to do so than either UPS and distribution workers on the one hand, or public sector workers on the other. That said, I think you are right to point out the ways in which FF15 will necessarily change the workers who are both involved in it and those around it, including in ways that the bureaucrats who are directing it will not expect or support. You’re also right to put the focus on ways that the struggle can generalize and cross-ferment. However, if you are right and there is a cross-fermentation of struggle, even on a minor level, it seems likely that the SEIU and Democratic Party would come down hard against it, and try to channel it into electoralism or after-work rallies. So the question remains, what could a radical workers’ organization do to “fan the flames of discontent” and try to strengthen that cross-fermentation? The SEIU international has, in fact, already gone out of its way to curtail the fast food workers’ movement and prevent it from further linking up with Ferguson insurgency. As I explain in my article, during the September 4 nationwide fast food “strike,” there was a serious chance for fast food protests in Ferguson to blossom into something of a localized mass strike situation in the low-wage service sector. In order to prevent this from happening, the SEIU canceled all protest activity in the St. Louis area and sent local fast food strikers out of town in preparation for the September 4 action. According to Kendall Fells — the leading SEIU official within the fast food workers’ organizing campaign — this decision was made in order to avoid “disrupt[ing] business” in the Ferguson area. My article discusses this incident in detail. [This is] not just significant because it concerns a huge corporation involved in a high-profile fight over wages; it’s a big deal because the NLRB’s general counsel recognized McDonald’s as a “joint employer” of its fry cooks and cashiers, meaning the company is considered the employer alongside the smaller franchises where those people work. That’ll teach me to reply before I’ve had a chance to read! The piece you wrote is very good. It’s the first I’ve heard of the connections between the McDonald’s and FF15, including the workers’ insubordination when dealing with victims of tear gas. You also give good, concrete examples of how the SEIU bureaucracy are deliberately trying to cut the lines of cross-pollination. confirms that you were right about fast-food workers seeing the connections here, and organizing accordingly. According to Diane, 200 fast food workers walked off the job in St Louis, which seems like much higher numbers than I’ve heard of from other cities. The $64,000 question remains: what could a radical workers’ organization do to spread the circulation of struggle, and actually take on the SEIU/Democratic machine’s attempts to put water on it?